Just about everyone I know feels time-starved these days. Between work, kids’ activities, and trying to keep the household running smoothly, it can seem like as soon as we check one thing off the list, ten more tasks get added! If you feel pressed for time, too, try these simple time saving ideas. 1. Sort as you go. Save time sorting laundry by investing in a three-compartment hamper. Then, sort items as you go. As soon as one compartment is full, throw a load into the wash. Keeping up with laundry saves time on the back-end, too. It’s easier to match socks when you’re folding one load at a time. 2. Put things away right away. Make it a habit to put things away when you’re done using them. Not only will your home look neater, allowing you to feel calmer and be more focused, but you’ll also avoid wasting time hunting for misplaced items. 3. Make a grocery list and sort it in aisle order! Making a grocery list ahead of time prevents extra trips to the store. And when you sort your list in aisle order, you’ll spend less time at the grocery store. Sounds like a win-win to me. 4. Fold or hang your clothes right away. Avoid spending time ironing by folding or hanging up your clothes as soon as the dryer dings! A simple kitchen timer or the timer on your phone can be used to save time in lots of situations. You could use it to set a limit on social media time. Or use it to put an end to procrastination (a huge time drain, by the way!) 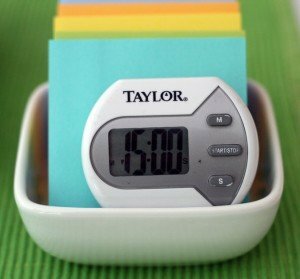 Simply set your timer for 15 minutes and use this time to make progress on a task you’ve been avoiding. 6. Do tough tasks during high energy times. Whether you’re a morning person or a night owl, make it a point to use your high energy times of the day to tackle the tough tasks on your to-do list. When you match your tasks to your energy level you’ll be more efficient and save time! When you’re making dinner, use the natural pause points to tidy up. For example, rinse out cans and throw away packaging while water is boiling. Put away ingredients you’ve already used while the sauce is simmering. Not only will you put little pockets of time to use, but you’ll also avoid creating an overwhelming mess at the end of dinner prep. 8. Double up and freeze it. When you make a favorite casserole or freezer-friendly soup, make a double batch. Serve one tonight and freeze the second helping for a busy weeknight, which could save you time and money! One of my all time favorite time savers is this: the less stuff you have, the less time you spend dealing with your stuff. 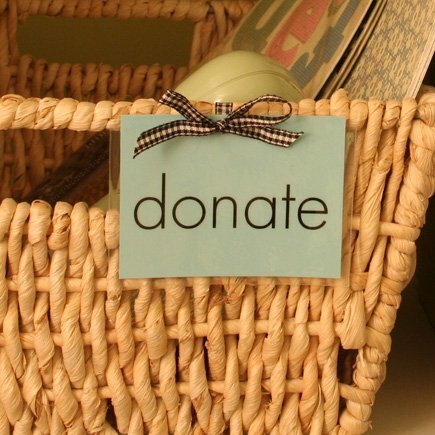 Make it easy to move things out of your home by setting up a donation station. Then, habitually put it to good use. When you bring new things into your home, consider what can leave in its place. Pick one day a week to run errands, and get them all out of the way at once. Keep a running list of items you need, and then plot the most efficient course to the stores you need to visit. As a bonus, fewer trips to the store and shopping with a list means less chance of clutter making its way into your home! What are your favorite time savers? I’d love to hear your tips in the comments. Thanks for sharing! I do several of these – guess I need to see about adding a few more! 1&4 – Laundry is pretty easy since we have no children at home – hubby has 2 laundry baskets (whites & colors) and I have 2 (work & weekend) so it is easy to see when to do laundry. 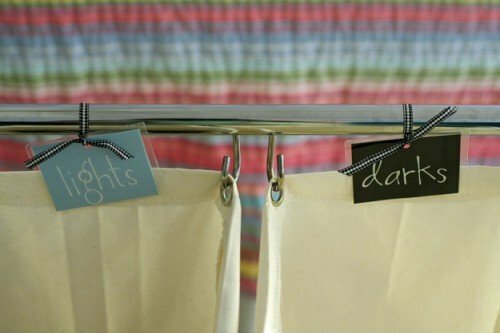 I have an inexpensive towel bar hanging from the bottom of a high shelf in the laundry end of the garage that I hang things from as I take them from the dryer (it’s over the trash can so I have to be careful with some longer dresses). I fold the rest and match socks right away so everything can be put away immediately. 3 – I have a grocery list program on my phone that has a place to record the aisle and I sort by that – will have to find something new once this old Palm Treo bites the dust! Anyone know of a good app for an Android phone? As I realize I need something I add a quantity needed on the phone. Before shopping day I make a quick swing through the kitchen, bathroom & cleaning areas to see if anything else is low and also add fresh meat & produce needed for the next few days. 7 – I have always done this – messy kitchen makes me crazy since mine is kind of small. I keep a sink full of hot soapy water during major cooking session so it is easy to clean as I go. 8 – As long as I don’t forget what is in the freezer this is great. I often just keep it in the refrigerator and we eat again within a week or so. Or I cook both and package the second one as leftovers in smaller containers for taking to work for lunch. So putting things away when done using them and purging regularly seem to be what I need to start doing. I’ve begun a major purge & pack session in anticipation of putting our house on the market soon. Hopefully I’ll be able to begin new habits in a new streamlined house – I think a year of traveling in a motorhome will help. Thanks for sharing your thoughts, Cheryl! You have a lot of terrific habits in place already. I agree that a year of traveling in motor home will help you be even more streamlined! How fun! thanks for the great ideas! Is the grocery list available as a printable? Hi, Valerie! 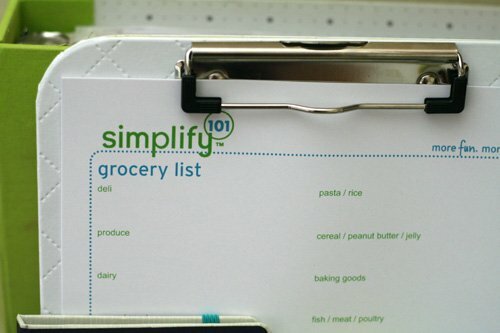 Yes, you can download that free grocery list printable here: http://www.simplify101.com/free-printables/meal-planning-grocery-list-printable/ Thanks!